Temperatures neared 124 degrees Fahrenheit in parts of India today. camera (Manish Swarup/AP Photo) In this May 11, 2016, photo, an Indian farmer sits in the front of his destroyed crop of cotton, alongside a road in one of the drought affected region of Marathwada, in the Indian state of Maharashtra. Temperatures in India reached a record-breaking 123.8 degrees Fahrenheit today, according to the Associated Press, suffocating parts of the country, and drawing further attention to a tragic rash of suicide deaths among the nation's impoverished farmers, who are battling drought and other environmental conditions that stifle agricultural production. May tends to be an extraordinarily hot month for India, but the recent heat has rendered wells, rivers, and reservoirs completely dry, punishing crop production for the estimated 95.8 million to 263 million who rely on farming to live, according to census data. Last year, a heat wave in India claimed 2,330 lives. Refrigeration and air-conditioning are a luxury there, and many rural residents do not have adequate access to electricity. Farmer suicides are caused by a number of financial factors beyond environmental conditions, and the country has undergone a dramatic shift in wealth from rural parts of the country to urban centers in recent decades. 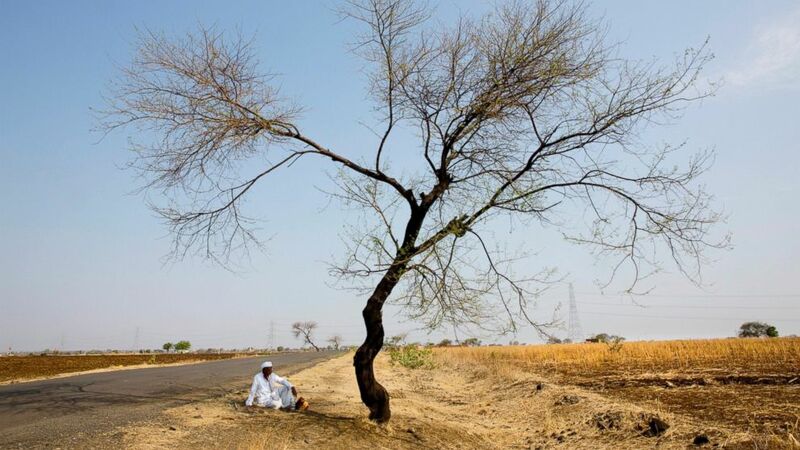 One agricultural region, Marathwada, located in the Indian state of Maharashtra, saw some 400 suicides through mid-May this year, according to a report published on Tuesday in The Indian Express newspaper. Over the past 16 months, 1,548 distressed farmers have been reported dead from suicide in the region, the paper said. ABC News has not be able to verify the suicide figures. Rajasthan, Gujarat, Bihar, and Uttar Pradesh are included among the states that have been most badly afflicted by the mass suicides, but the problem is considered to be a pervasive throughout the country. Some officials have attributed the farmers suicides in part to climate change in the past. "This is the first effect of climate change, I must say. Because of it, there is no water, there is no agricultural development, and that is why farmers commit suicide," Maharashtra's Rural Development and Water Conservation minister, Pankaja Munde told an Indian cable news network in December 2015. (Alain Jocard/AFP/Getty Images) Indian Prime Minister Narendra Modi delivers a speech during the opening day of the World Climate Change Conference 2015 (COP21), on Nov. 30, 2015, at Le Bourget, on the outskirts of the French capital Paris. 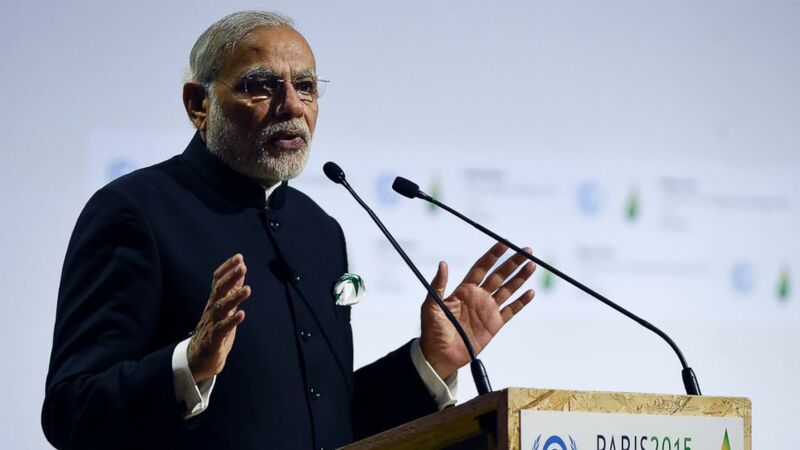 India was in the spotlight at the 2015 United Nations climate change conference in Paris, where Prime Minister Narendra Modi argued a case for India to strengthen development, while simultaneously acknowledging that climate change is causing danger to the densely populated county. 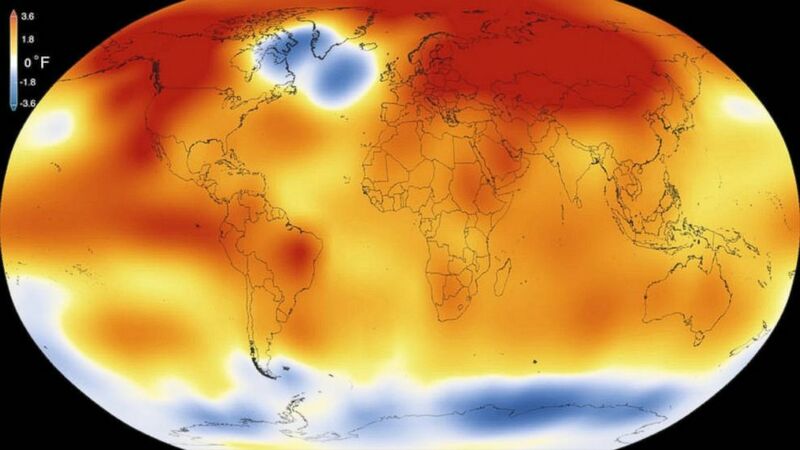 (Scientific Visualization Studio/Goddard Space Flight Center/NASA) 2015 was the warmest year since modern record-keeping began in 1880, according to a new analysis by NASA’s Goddard Institute for Space Studies. "The heat wave in India is another example that our climate is changing," said Ben Horton, a scientist at the University of Rutgers who focuses on climate change. "We are now experiencing climate extremes that include droughts, wildfires, flood, storms, and tropical cyclones as well."